Banknote counterfeiting techniques are becoming more sophisticated and widespread and effective counterfeit detection is more important than ever. Counterfeit detection needs vary widely, depending on the particular the advanced detection technology. 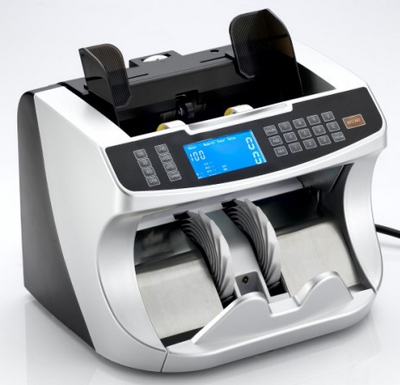 The Golden-850 banknote counter features a unique function for determining the value of counted notes. After the notes have been counted, the total amount and subtotals for each note value are displayed. This machine will only give you the value of the bills counted. For instance if you have a stack of 10 ,EUR20 bills, the machine will tell you that you have EUR200.00. . The Counterfeit detection functions are by UV, MG, MT. The mixed counting functions are by color sensors +MT+DD.